Today Canada and Chile celebrate the coming into force of the modernized Canada-Chile Free Trade Agreement (CCFTA), which builds on the successful trade relationship and will stimulate new trade and investment and create more jobs for workers in both countries. The new agreement fulfills a fundamental objective of Canada’s trade diversification strategy to enrich its existing agreements with new progressive elements that both advance gender equality and encourage women entrepreneurship. 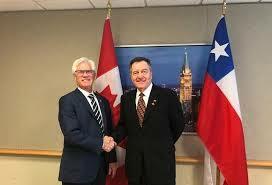 Yesterday, the Honourable Jim Carr, Minister of International Trade Diversification, met with Roberto Ampuero, Chile’s Minister of Foreign Affairs, to celebrate the entry into force of the agreement, which builds on the existing 1997 CCFTA. It also represents a historic achievement for Canada: for the first time, a Canadian free trade agreement includes a dedicated chapter on trade and gender—a first of its kind for any G20 country. The new chapter acknowledges the importance of applying a gender perspective to economic and trade issues to ensure that economic growth benefits everyone. Canadian and Chilean officials continue to engage to find news ways to advance gender issues and to plan for the year ahead. The new and progressive chapter on trade and gender is matched by steps to modernize other sections of the agreement, including new chapters on sanitary and phytosanitary measures and technical barriers to trade, and updates to the existing investment and government procurement chapters. Bilateral merchandise trade between Canada and Chile was valued at $2.9 billion in 2017, an almost fourfold increase since the original CCFTA entered into force in 1997. Between 2015 and 2017, on average, Chile was Canada’s third-largest trading partner in South and Central America. At the end of 2017, the stock of Canadian direct investment in Chile stood at $17.1 billion, making Chile Canada’s top investment destination in South and Central America and 10th worldwide. Chile is a signatory to the Comprehensive and Progressive Agreement for Trans-Pacific Partnership, which entered into force for Canada on December 30, 2018. Chile is also a partner for Canada in the ongoing negotiations toward a Canada-Pacific Alliance Free Trade Agreement.